Walgreens Listens Sweepstakes: Walgreens listens to their customers and rewards them for completing a short Customer Satisfaction Survey. Visit www.walgreenslistens.com and enter the Walgreens Listens Sweepstakes for a chance to win the grand prize of $3,000, awarded in the form of check. The Walgreens Listens Sweepstakes is open only to legal U.S. residents, 18 years of age or older at the time of entry, excluding the residents of Puerto Rico. The Sweepstakes begins at 12:00:01 AM (CST) on April 1, 2019 and ends at 11:59:59 PM (CST) on April 30, 2019. The grand prize consists of $3,000, awarded in the form of check. Visit www.walgreenslistens.com to enter and see Official Rules for details. I love the being able to save so much money at Walgreens pharmacy. I also love being able to find fair prices on makeup and all the sales. ive been a long time costumer in this pharmacy, its clean and very organized really a great store i love it. I love wallgreens. Staff are friendly. The store is clean. I LOVE WALGREENS CAUSE THEY HAVE CARING HELPFUL NICE SWEET KIND WONDERFUL STAFF WHO GREET YOU WHEN U WALK IN N THEY HAVE THE MOST BEAUTIFUL SMILE. SEE I LOVE THEM FOR THE STAFF PRICES N LOVE THEY GIVE TO YOU SO YOU KNOW THEY ARE THE WOMEN N MEN OF GOD SO KEEP UP THE EXCELLENT JOB YOU ALL DOING N KEEP GOD FIRST IN YOUR LIFE GOD ???? U N I DO 2. I only live a block away from there.I,m always there.I know every one who works thre! Same with me. I’m there everyday. Wish I would of thought about entering sweepstakes before today since I have 100 receipts from there. Just wanted to let you know when I was shopping in Walgreens in Butler, PA I had a great experience. Your employee Ruben is a very caring employee. He made sure the items I was purchasing were the ones on sale, he was very helpful. The other comment I have about him is that he is very personable, let me explain. My Mom shops in your store quite often and I know when she has because she always says, Rubens was working today with a smile on her face. She likes that he knows her name and speaks to her when she comes in or is checking out, makes the store a friendlier place to shop. When we entered the other night he said “hello” to her and it wasn’t just her I could hear him greet many customers with their first names. That’s nice and makes a person feel special and want to come back. Awesome employee you have with Ruben, he really is a nice guy and you can tell him Teresa and Lois think so. Thanks. LIKE SHOPPING AT PUBLIX, BUT DON’T THINK I HAVE TO PUT MY GROCERIES IN THE BUGGY TO CARRY OUT. SHE JUST LEFT THEM ON THE COUNTER FOR ME TO PICK UP AND PUT IN MY CART. It’s always a pleasure to visit Walgreens. The staff ALWAYS makes you welcome. Everyone knows where the items are. I love shopping in Walgreens because everybody helpful to their customers. Specially when buying an over the counter medicine, for an emergency situation. A representative accompanies the customer and will explain the use of the medicine. They are very polite and pleasant at all times. You can find everything in there, from prescription medicines to photo to clothing , makeups, snacks, fruits, greeting cards, hair cares, foot cares. Prices are affordable and they offer sales too. 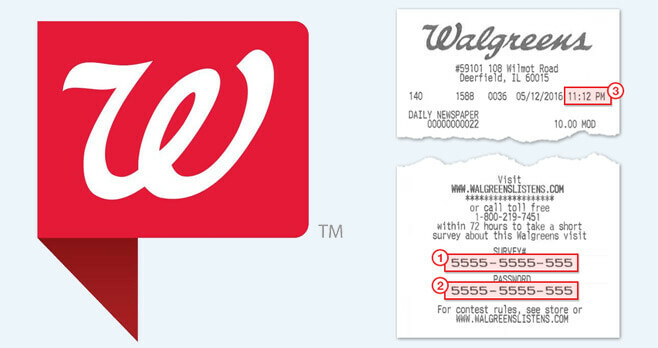 If you’re a member, there are discounts/rewards by points every time you buy anything from Walgreens. So, come and be a member, I promise you’ll never regret it. I want to enter the sweepstakes. My survey number expired. No purchase necessary! Bull! I have been a customer for 10-12 years, not long after walgreens opened in Gatesville, Texas. I got out of the hospital on 9/7/2017, sister took me to pharmacy to get 3 prescriptions filled. The tech at the window was so rude because the hospital doctor did not put my first name & birthdate on the script. The script was Not a controlled substance, they were Lasix, Coreg & an antibiotic. She said you will have to go back to the dr and he has to fix the script. I explained that I just got out if the hospital, the script had the name of hospital on it, and the dr would not be there because it was already 5:00 pm. She said well, you have to go back to the hospital and they have to fix it and make sure they initial it so I know they did it. She never said “I’m sorry but that’s our policy, let me check to see if we can do anything, just a snotty attitude. We left to go back to hospital, and on the way I told my sister to go to HEB pharmacy. The clerk took the script, asked me my birthdate and I said the dr had left off my first name, she said “no problem, I’ll call the hospital and get authorization and your prescriptions will be ready in about 20 min”. I haven’t done business with them but a few times but I was still in their system. We went back, prescription filled and paid and On my way. You can guess what u did this morning, called walgreens & talked to a pharmacist & told him what happened and all he could say is, I’m sorry you had trouble. I said I will be transferring all my prescriptions to HEB and he said ok. So now I use HEB pharmacy. That older lady at Walgreens pharmacy ran off a long standing customer because she was hateful, rude and didn’t even try to help me. Thanks Kim in Walgreens in Northport Al highway 82. Knows her meds. Love Walgreens …Pass Road and Lorraine in Gulfport MS. Customer Service keep me coming back. Just left there and Hope Taylor is amazing…great people skills. Always enjoy the service at Walgreens, all stores. Stores are well lit and arranged and make the shopping experience easy. Yesterday I went to pick up scripts at my Spring Hill Walgreens on Mariner and Cortez. I was informed by a pharmacy associate that a coupon was available to lower the cost of my scrip by $25.00. She spent a great deal of time with me and was extremely patient as I was having difficulty pulling up my necessary phone info. She ended up doing it for me. Her name is Dana and I am very appreciative of both her help and kindness and patience. Walgreens, you have a jewel in this employee. I would have liked to enter for a chance of winning something from Walgreens, but the receipt I obtained for my purchases didn’t say anything that a prize was already given to someone on 19 December. I made a purchase on 26 December and today’s date is 29 December. I would have been in the 3 day window to enter if there was really a give-a-way possible. It seems that Walgreens should have stopped advertising this give-a-way once a person was chosen on 19 December 2017. I recently completed & submitted my sweepstakes entry after my latest visit to our local Walgreens store here in Greece, NY. I picked up a prescription and did general shopping and was taken care of by both the pharmacist & the front end checkout young lady who were both totally wonderful in how they were genuinely caring, considerate ,friendly & helpful. This is just one example of how my wife and I see and feel about the “team” at this store !! I was supposed to enter our home phone for the sweepstakes entry but instead put down a cell # that does not have voice mail and may not work all the time. Would you please be able to allow me to provide you our home ph# in case we may be selected ??? Thank you very much & Happy New Year to you and all your wonderful Walgreens team! Like your Walgreens in Sapulpa Ok. Jamie was very nice to me and my sister when we go in to pick up perscriptions for my nieces. I always look for Jason when I enter this store during the evening hours when I can’t find something or if it is no longer stocked on the shelf. Jason will always take the time to go see if they have it available in the back where the products are stored and more often than not he will find it for you, and I appreciate that very much. BIG shout out to Jason for his professionalism and excellent customer service. i am in process of leaving , walgreen no longer honor my plan , last order of metropolo $44.00 called aetna ins. at participating pharmacy $14.00 . Thank you Mary, Connie and JoAnn for ALWAYS being so nice and for providing excellent customer service with a smile. Mary saved me money today on M&M’s by suggesting I get a larger bag that was actually on sale that I was not aware of. That’s why I love this store so much, the staff are the BEST! I use the Walgreen’s located in Rutherford College, NC. The pharmacy staff is very helpful and always polite. Kudos to Dessy, Greg, Juanita, and Nick . It’s always a pleasure to see them. ALL the employees are polite and will help with any question anyone might have. Wonderful, clean, and neat store with well-spaced aisles, and always easy to find what you’re looking for. I’m thankful they are there. You people do realize that Walgreens will never read these comments because this isn’t Walgreens website? It’s a totally seperate blog and have nothing to do with Walgreens as a company. We have been with Walgreen’s for several years. Today we tried to pick up medicine because we were told it was ready. First we received a call stating it was ready. My husband called to verify that it was ready, and he was told that it was. That was the second time we went to pick it up because he was told it was ready. When we arrived, we were told it was ready, but not to where we could pick it up because your system was down. A lady in line told us that the system had been down already for twenty-four hours. That is not a very professional way to handle business considering Walgreen’s primary business is a provider of medication. The manager did try try helping, but with the system down, we had to pay cash at full price for the medication and then come back later to have it run through insurance. He could give no answer as to when the system would be back up. The only reason we paid for the medication out-of-pocket is because it was needed right away. If this is the way Walgreen’s thinks about their customers, maybe we need to move on and find another provider for the medication. Our whole family does a lot of business there, but that can always change. PS: When an employee says it is ready, that should mean that is is ready to walk out the door with – not that it is ready, but the system is down and we can’t take it. You need to train your staff on the proper way to tell a customer whether it is ready or not. It is either ready to pick up and go or not – no in between. And hire better IT staff. 5,000 reward points is not good for all the problems. The manger (Kris) REALLY did try to help but you had his tired. Thanks, JoAnn, for going out of your way to help me today with my photos. I appreciate you ALL very much, to include Mary, Connie and Jason for your professionalism and great customer service. At the bottom of my receipt that I got on December 1st 2018 states that I can enter in a monthly sweepstakes for $3,000 cash. They just wanted me to answer some questions on a brief survey that lasted over 7 minutes then ask for name and number and that’s is when they stated that the the contest was for September of 2018.”?” Walgreens do you want to let me know what is up with that??????? Seriously.